This iPhone to HDTV converter cable DISPLAY your iPhone/iPad data from small screen to big screen including crystal clear voice. 4K high definition image display Adopt Coaxial cores to ensure efficient and smooth transmission. Let's enjoy mirroring! Connect the USB to the power adapter (NOTE：5V/1A for iPhone iPod Touch, 5V/2A+ for iPad). Wait about 5 seconds, click "trust" and it will mirror your iPhone/iPad to HDMI-equipped devices automatically. 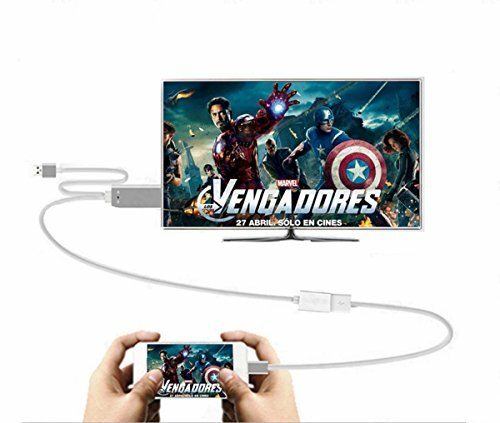 Support: Apps: iPhone to HDMI cable adapter work with YouTube,Facebook, Instagram,Twitter,Reddit, Pinterest, Snapchat,Miscrosoft Office, IDMB, etc. Video Calls from FaceTime, streaming videos,pictures, games, Skype, WhatsApp, etc. Not Support (Due to there are privacy restrictions which prevent any paid subscriptions to be cast) : this HDMI to lightning cable WON'T work with certain paid Apps,Such as Netflix, Amazon Prime videos, Hulu, Comcast tv, Xfinity, Vudu, DIRECTV, Cox, Honda,iTunes etc. ★Easy Way, Bigger View - No wifi & Airplay & App needed. Simply plug the lightning cable into your devices, click the "TRUST" option while it pop up and wait about 5-10 seconds for connection automatically. ★Excellent for users while they are playing games, watching movie,playing video calling,doing business presentations,calling a meeting, and so on. Support charge your phone while using. ★Compatibility:The lightning to hdmi adapter compatible with All of the over IOS 8.0 Version iPhone & iPad. Including iPhone X/ 8 / 8 Plus/ 7 / 7 Plus / 6s / 6s Plus / 6 / 6 Plus / 5s / 5 / iPhone SE / iPad Pro / iPad Air 2 / iPad mini 4 / iPad mini 2 /.Samsung S3/ S4/ S5/ S6/ S7/ S9/ NOTE3/ NOTE4/ NOTE5/ NOTE7/ Huawei P8/ P9/ MATE series/ glory 6. ★1 Years Warranty: Free 12 Months warranty and lifetime technical support.